EAST RUTHERFORD, New Jersey – For the 17th straight year, ATK Audiotek provided audio services for the National Football League’s championship game, Super Bowl XLVIII, the first ever in an outdoor cold-weather stadium. 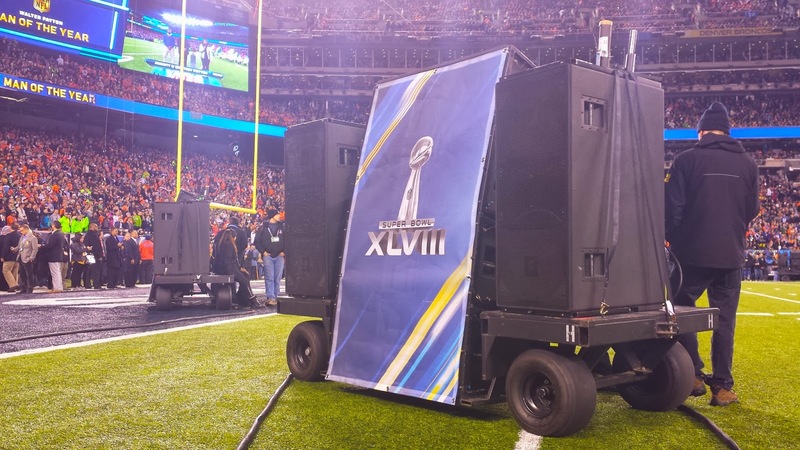 ATK Audiotek deployed its custom-designed, cart-based audio system for the game’s prestigious halftime show, held at MetLife Stadium in East Rutherford, New Jersey. Once again, ATK Audiotek outfitted their system with HARMAN’s JBL VERTEC® line array loudspeakers. In a battle between the league’s top-ranked offense and defense, Super Bowl XLVIII, broadcast via FOX, reached an estimated 112 million viewers. This year’s Halftime show featured popular pop-singer Bruno Mars, with a special guest performance by the Red Hot Chili Peppers. The Post-Game Show featured the presentation of the Lombardi Trophy to this year’s NFL champion Seattle Seahawks. 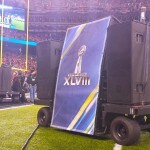 For the event, ATK Audiotek deployed 16 of its custom-designed field carts, which allow for easy transport and setup of the JBL VERTEC loudspeakers on and off the field. The system featured 14 carts equipped with four boxes of VT4889 line array elements (56 total), two carts with five boxes of 4889’s (10 total), and each cart was also equipped with two VT4880A fullsize arrayable subwoofers (36 total). Additionally, ATK Audiotek mounted eight VRX932 Constant Curvature loudspeakers on the back of several carts for field fold back, deployed four VT4886 loudspeakers on two popup stands for coverage of the seats behind the stage, and used four more 4886’s for front fill.